French tarragon (Artemisia dracunculus), a most rewarding herb. French tarragon Artemisia dracunculus is one of the trickiest herbs to grow, but also one of the most rewarding. It’s anise-like flavour is clean, subtle and delightful, while also being penetrating; a little goes a long way. It has smooth narrow bright green leaves on stalks that grow from a spreading roostock. Growing to about 40 cm, it rarely flowers, and never sets viable seed. 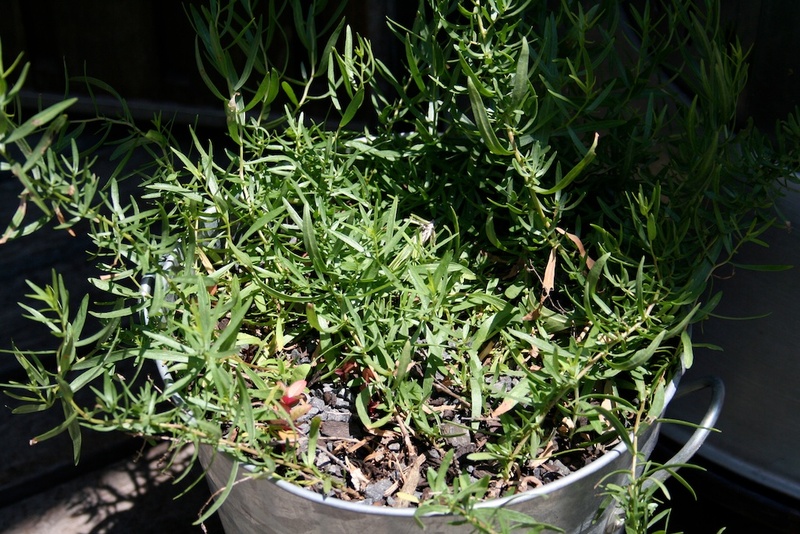 French tarragon growing in a deep galvanised bucket. Russian tarragon (A. dracunculoides) is similar, but much more vigorous; it both flowers and sets seed. However the flavour is muddy and it is not a good substitute for French tarragon and I would not bother growing it. 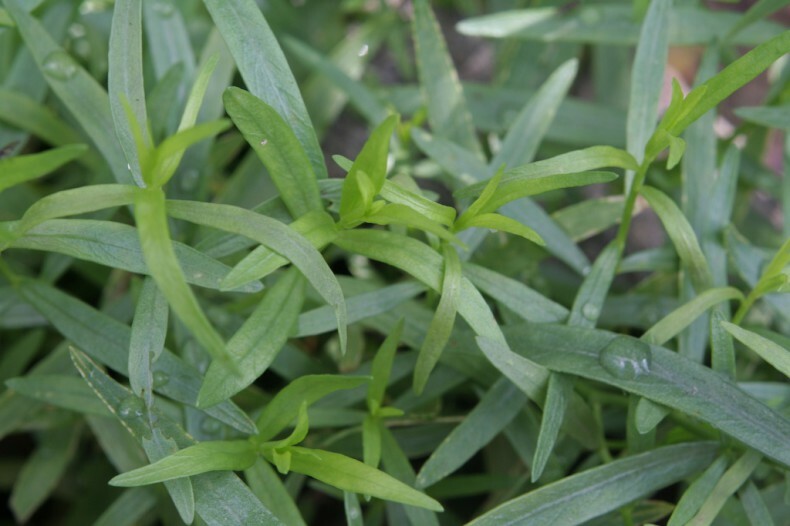 Although French tarragon is difficult to grow, once the right position is found, it will thrive. Its main requirement is a well-drained slightly gritty soil that is pH neutral or slightly acid, sunlight for about half the day and reasonable water in dry weather. English books tell us that it needs full sun but I find, with our more extreme summers, it does best in a position with morning sun and afternoon shade. Propagate tarragon by root division in early spring, or take cuttings in summer. Every two to three years dig up the whole plant in spring and replant some pieces into fresh soil with well rotted manure and compost added, otherwise it’s serpentine roots eventually choke the plant. 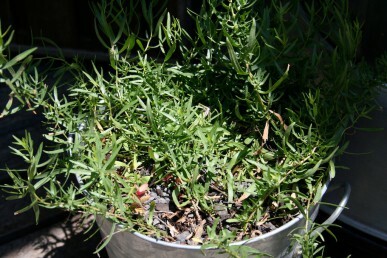 Tarragon also grows well in a deep pot. Tarragon is a true herbaceous perennial and so disappears completely in winter and is often late to reappear in spring. Make sure you mark where it is planted so you don’t dig it up by mistake. In very cold regions with heavy frosts the roots may need to be protected in winter with a layer of straw. Tip prune regularly to keep it growing densely although if you are using the tarragon all the time this will naturally tip prune it. In warm humid regions, tarragon generally succumbs to fungal diseases. So it is not suitable for tropical or even many sub-tropical regions. In marginal areas you can try keeping the foliage as dry as possible by growing it in a pot in an open, airy position, avoid wetting the leaves when you water, and mulch the root zone with pebbles to help create a dry environment. 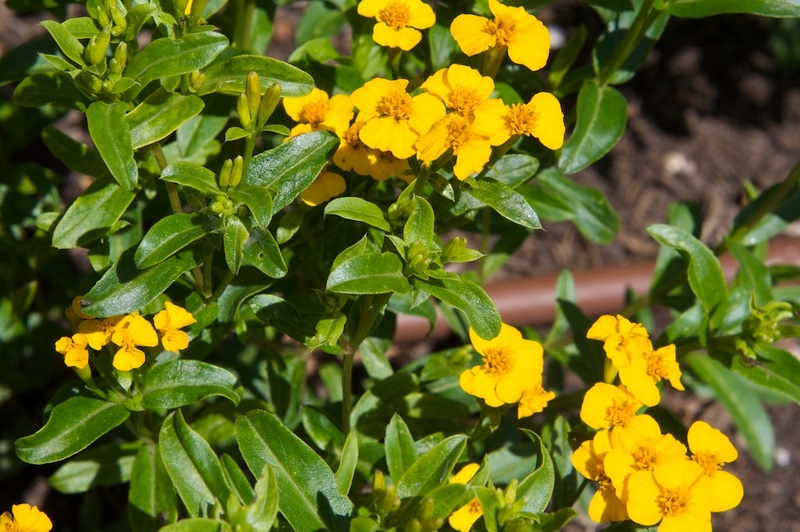 If you can’t grow this plant, try growing winter tarragon (Tagetes lucida). It thrives in tropical and sub-tropical regions and has a similar but stronger and coarser flavour, so use it in smaller amounts. French tarragon is a classic culinary herb. It combines beautifully with any dish containing eggs or mushrooms and with a range of chicken and fish dishes. It’s also added to salads and sandwiches, used as a garnish with soup and is part of the herb combination fines herbes, (a mixture of chervil, parsley, chives and tarragon) that is added to stock, fish and poultry. My favourite way of using French tarragon (apart from sprinkling it over slowly roasted mushrooms) is to add it to vinegar. In the height of summer, stuff a wide mouthed jar full of fresh tarragon leaves and stems, pour a really good white wine vinegar over the top and leave to stand on a sunny windowsill, shake every few days. After about a month, strain the vinegar into a bottle, add a fresh sprig of tarragon and then use this vinegar right through winter (when no fresh tarragon is available) to make salad dressings and marinades or just sprinkle over veggies or meat. This spring go and buy a pot of French tarragon and add this delectable herb to your repertoire. And how can you be sure the plant you are buying is true French tarragon? Break off a leaf and chew it, if it is French tarragon then the tip of your tongue will go numb.